Bonita is a blogger, artist, creator, mother, wife, traveler and the list just goes on and on! What started as a love of Japan and Japanese culture slowly grew into a full blown addiction to vintage things! From clothes to collectables Bonita loves them all and is supported in her passion by her husband and three children. Blogging started as a way to document her vintage journey. 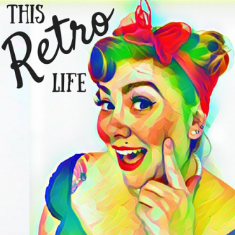 We’ve all been there as we start to build the confidence to be ourselves and embrace our vintage loves each and every day. Now it has became a place to meet people right around the world and develop friendships with like minded people. Bonita also gets a chance to share her love of art, cherry blossom trees, her health battles, family challenges and so much more. And life is about to get a little more hectic for Bonita. She is about to relocate from Australia to Thailand with her family! So if you’re in the vintage community in Thailand or have suggestions on the best places to find vintage things let Bonita know. You can listen to our chat with Bonita in episode 22 of our podcast. Make sure you subscribe wherever you find your podcasts so you never miss and episode.